The Good Geek: How Many Kindle Units Have Shipped? The Amazon Kindle is finally available in regular stock! Amazon still isn't saying, but Digitimes reports that PVI, the maker of the 6-inch e-ink screen used in the Kindle and the Sony EBook Reader, claims to be shipping 60,000-80,000 units per month. Of those, PVI states that 60% go to Kindle, and 40% to Amazon. I find those numbers hard to swallow. The Kindle went on sale last November. At those rates, Amazon could have sold 180,000 units. Let's be conservative - there were shipment problems at several points with the Kindle - and round down to 100,000. That's not a number to sneeze at, so why isn't Bezos talking? I desperately want an ebook reader. (I'd buy an iPhone yesterday if they weren't forbidden by the IT Security Gods at my office.) I occasionally ruin my eyes by reading ebooks on my Nokia E62, but it's a poor substitute for a dedicated device. Baen has a lovely ebook program - no DRM and they pass on their savings to their customers! 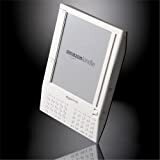 - and even Amazon reduces ebook ook reader. A reader would even allow me to carry hundreds of books in my purse (and as the survivor of several international flights, let me add that there really are times you need that many). Sadly, I just can't bring myself to cough up $399 for the half-finished, DRM-crippled product that is the Kindle. (Despite arguably better features, no other ebook reader can really compete with the Kindle, since only Kindle delivers direct device sales.) The final nail? You can't read a Kindle format ebook on anything other than a Kindle - not even your PC. So if an ebook reader/book addict/tech geek like me hasn't bought a Kindle, how on earth is PVI getting away with implying that Amazon has sold more than 100K units?